﻿ Best Price on La Catalina Hotel & Suites in Birri De Santa Barbara + Reviews! Offering a peaceful setting in the countryside 10 minutes’ drive from Heredia, This clothing-optional hotel features 2 swimming pool, hot tub and a spa. This adults-only hotel has a restaurant overlooking its gardens. 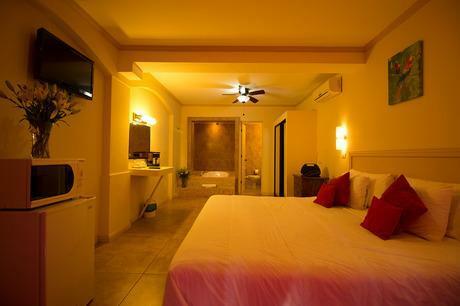 The attractive rooms, suites and apartments at La Catalina Hotel & Suites have classic décor. There is cable TV, free WiFi, a microwave and fridge. The Temptation Bar & Restaurant serves a range of creative Costa Rican cuisine on its terrace. The poolside sports bar serves light meals, and guests can enjoy a post-dinner drink in the Library Bar. There is also a cigar bar. The Desire Spa offers a range of treatments, including massage, wraps, manicures and pedicures. The hotel also features a hot tub and a gym. The surrounding region is ideal for hiking and cycling, and Poás Volcano and La Paz Waterfalls can be reached in 40 minutes by car. The hotel organises tours of local rainforest, bird sanctuaries, nearby beaches and coffee plantations. Juan Santamaría International Airport is 20 minutes' drive away. Please note this adults-only hotel has an clothing-optional swimming pool.